Talks: Ten Years as ESA's Science Director, by Professor David Southwood. David is the Patron of our Society and was President of the Royal Astronomical Society from 2012-14. Learn how to modify your old webcam to make an astrocam suitable for attaching to your telescope. Further details on our Facebook page. Bring your own webcam if you have one. Talks: Star Formation in Spiral Galaxies, by Dr Clare Dobbs. Clare is with the Astrophysics Group at the University of Exeter. Her research involves modelling galaxies to understand how giant molecular clouds (GMCs), the sites of star formation in galaxies, form and evolve. At the Wembury Beach car park (map on the Join us page), 7.00pm onwards. At the Wembury Beach car park (map on the Join us page) from 8pm. Talks: The Human Exploration of Space: from Tsiolkovski to Tim Peake, By Dr Mike McCulloch. Mike is a Lecturer in the School of Marine Science and Engineering at the University of Plymouth. Talks: Exploring the Atmospheres of Exoplanets, by Dr Nathan Mayne. Nathan is a Senior Lecturer in the Astrophysics Group at the University of Exeter. He is collaborating with the UK Met Office to produce a theoretical model of exoplanet atmospheres. At the Wembury Beach car park (map on the Join us page) from 7pm - everyone welcome - no need to be a PAS member. Talks: Basic Telescope Terms Explained - Simply!, by David Wilton. 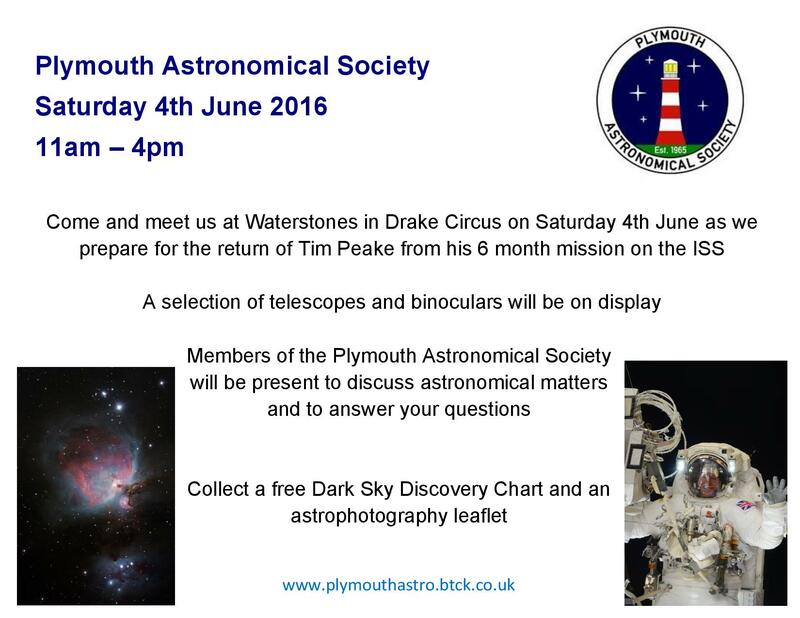 The talk will include illustrating the ideas using different types of telescopes which will be on display. Talks: The Rosetta Mission: updates from comet 67P and what this means for the origins of life on Earth, by Claire Davies. Claire is a Research Fellow in the Astrophysics Group at the University of Exeter. There is no "talks" meeting in August 2016. The next meeting will be on Friday 9th September 2016.